Sometimes, businesses that have been going for a long time can start to become tattered, with marks appearing on walls and furniture becoming worn out. In order to keep your premises looking it’s best, it might be time to consider investing in some TLC. There’s so many benefits of refurbishing a business; not only will it be an exciting venture for you, it’ll also be great for your customers. You’ll impress the regulars and you’ll also catch the eye of first time visitors and keep them coming back time and time again. 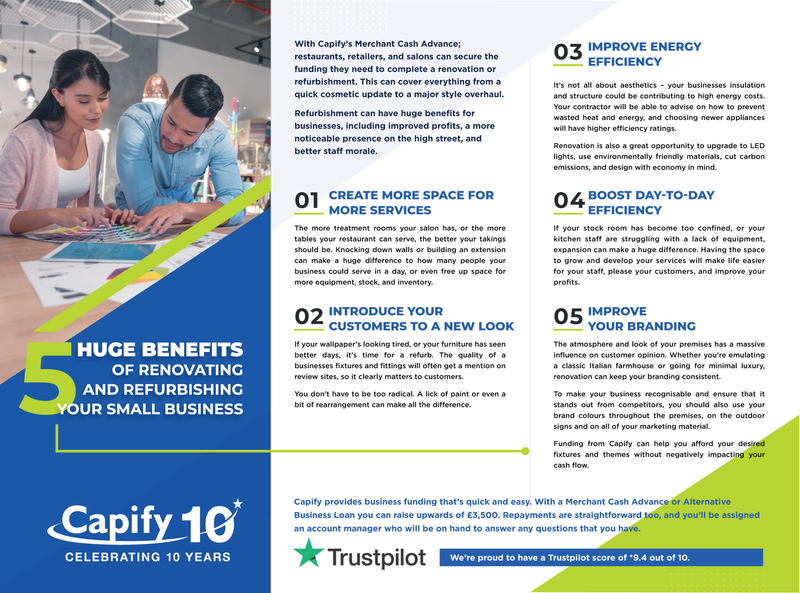 If you’re interested in completing a major renovation, or maybe just a small refurbishment; Capify can provide you with business finance from £3,500 – over £150,000. Lots of our customers use this money to revamp and improve their businesses.